MET has a different mechanism than TENS. It works on a cellular level and has its effects much closer to the cause of the injury. While everyone talks about back pain, many doctors often question whether patients really have it. Clinical and technical examinations such as X-rays, scans, MRIs and kinesiological evaluations may not always reveal a clear cause. Classic treatments such as nonsteroidal anti-inflammatory drugs, epidural infiltration and even surgery do not always solve the problem. However, physiotherapists already have a better solution-one that is pleasant and may competently control the pain without much interference with daily activities. In America, the use of a transcutaneous electrical nerve stimulation (TENS) device is common. On the other hand, microcurrent electrotherapy (MET), even though it’s not that new, may not be common enough. In this article, we will compare TENS to MET, using the eight-parameter law, and see which gets the most credits. Bringing together every possible influence in electrotherapy leads to a list of eight parameters. Biphasic waves are much smoother to the skin than monophasic. Monophasic waves are known to cause skin burns in long treatments. This will be no problem for TENS or MET, because they are both biphasic or can be switched to it. On some occasions, the polarity is important to get a specific effect such as on wound healing or on bone. In this matter, we are dealing with back pain so that these effects are complementary. Howson believes that human skin resistance will deform and decrease the initial wave. Maybe this indicates that the waveform is not of primal importance as long as it is biphasic. Keep in mind, however, that these conclusions were made using TENS devices! They may not apply to the more sophisticated MET technology. MET stimulators differ through their waveforms. Though treatment circumstances were comparable, pain-reducing effects were not always the same with different types of stimulators. This is an open field for investigation. There’s no evidence for an overall efficient frequency. Most studies indicate that TENS frequencies in the 50-200 Hz range are used often with good effects. MET uses other frequencies. Empirically extreme low frequencies in the 0.3-3 Hz range have shown the best results. It seems that 0.5 Hz is especially good for pain relief. In some cases, 1.5 Hz may give better results. To release endorphins, one should choose frequencies less than 8 Hz. At this time it isn’t completely certain that MET triggers the endorphin release system with electrodes placed on the trunk. However, MET, being of lower current by definition, is sometimes used on the head where the mechanisms are different and where endorphins are more clearly implicated. Howson, Li and Bak investigated stimulation thresholds for afferent nerve fibers. Their findings show how A and C-fibers can be stimulated with pulse widths larger than 200 µS. According to many studies on the effect of electrical stimulation and endogenous opioids, these fibers should be stimulated to start endorphin release. On the other hand, but still according to Howson, Li, and Bak, pulse widths in the 60 µS range should be used only to affect A (-fibers and thus use Melzack and Walls gate control) to achieve the effect of pain decrease. It may be clear that in this latter situation, optimal use of the gate- control mechanism should not trigger any small, pain transporting A (-and C-fibers). These two mechanisms of controlling the pain can be used by adjusting the pulse width of the TENS device. MET, however, uses much larger pulse widths of 0.1 – 2.0 seconds. Due to the much lower intensity, it is believed that afferent fibers will not be affected in the same way. Cheng, etc. reported a significant increase in ATP at intensity levels below 750 µS. It is probable that these large pulse widths are also necessary to achieve effects on ATP production. Interrupting the stimulus is used to avoid adaptation of the central nervous system. Both TENS and MET pulses use this technique. Some authors believe that pulsed painful stimuli will trigger the endorphin release. TENS has an extra possibility to interrupt the current by switching it into burst-mode causing the patient to report an “on-off feeling.” A series of pulses alternating with pauses known as the burst-mode is the real pulse train technique in TENS. Another way to avoid adaptation is presented by electronic modulation of intensity, frequency and pulse width. Manual frequency modulation is well-known in the use of interferential current but will not be discussed in this paper. Some patients don’t like the “on-off” burst feeling, which makes modulation a good alternative. From a theoretical point of view, three different possibilities can be used in TENS (1.6.1 – 1.6.3). MET probably uses the same three (1.6.4-1.6.6) as well, but they have a different underlying explanation. Cleaning the skin prior to treatment or regularly wetting the probes may be more important than the choice of electrodes. Self-adhesive electrodes, whether they are carbon or silver, usually are the easiest to use. In most cases, silver ones give the best results. Since this paper is about back pain, the real local electrode position isn’t really at stake. Electrodes cannot really be put on the pathologic site. In knee or shoulder problems, where the injury or disease is between the electrodes, the milliampere current could cause side effects. In back problems, the pathology is deeper in the body, at the joint or the disc. However, the possible negative effects from milliampere currents on healing can not be denied (see 2.3). The most suitable electrode types are carbon or silver ones. If pain decrease is to be achieved on a gate-control basis, a one-inch mistake can cause the treatment to have no effects at all. According to endorphin release theory, any position that stimulates A (- and C –fibers) will do the right thing. From a practical point of view, a vertebral position, counting the spinous process (SP), will always lead to correct electrode placement. To avoid misplacement, the electrodes can be placed above and under the SP. The stimulus reaches the medial ramus cutaneous of the spinal nerve. In a few occasions, positions 1 or 2 inches lateral of the SP may enhance the results, probably because it causes stretching effects on the capsule of the facet joint. The intervertebral disc may be the subject of comparable effects; i.e. some patients with nerve root compression report more pain relief when electrodes are put on the paravertebral muscles of the opposite side using intensities above motor level. Again carbon or silver electrodes can be used. Myofascial trigger points (MTP) and acupuncture points both require specific knowledge. Though literature indicates that TENS can be used on these, MET might be in a better position to treat trigger points. Acupuncture points can also be used, of course, but these shouldn’t be treated in a “cookbook way.” Acupuncture is mostly an art and can not be left to inexperienced therapists. As to the type of electrodes, the same remark can be made. The electrode type makes a big difference and, as in TENS, specific positions can give very good results. 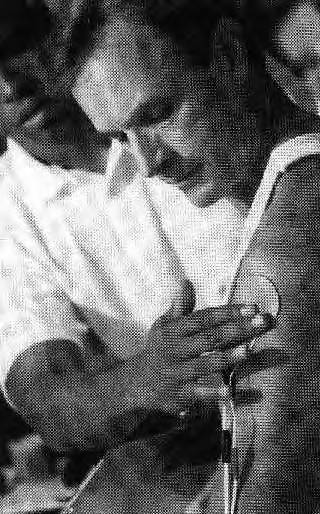 Probes can be used for shorter treatments of two to 10 minutes. If longer treatment is needed, the use of self-adhesive electrodes will be much easier. In MET, it is very important to send the current through the injury site. Therefore, probes should be held dorsal and ventral or left and right of the trunk. Many positions are necessary for all kinds of back pain whether it be an intervertebral disc or a facet joint problem. The probe positions should describe a large “X” through the pathology. These are meant for longer treatments: 30 minutes up to several hours. A little experience is necessary to put them in the right position. The best results will be obtained with ventro-dorsal positions-the dorsal one just below the spinous process of the injured level. The ventral one may need various positions, although in most cases placement opposite to the dorsal electrode will give satisfactory effects. Sometimes it is better to shift it a little in proximal, distal, left or right directions. This parameter is probably the most important one and if the treatment fails, one should reconsider the electrode positions first. A trial and observation approach is recommended. Again, carbon and silver electrodes give good results. Of course microcurrent can also be used on trigger points and acupuncture points. However, the same remark must be made as with TENS. In addition, from the physiological background of MTPs and microcurrent, it may be that microcurrent is better suited to treat the MTPs than TENS. Microcurrent has an effect at the cellular level that is not found in TENS. The electrode type (probe, carbon, silver, etc.) probably causes no difference. This is a very important parameter. Pain relief through gate-control usually lasts only a few minutes after treatment. This is probably not what the patient came for. Thus repeating the treatment several times a day can solve this problem. Using the TENS device with larger pulse widths to obtain pain relief through endorphin release will not be much different. According to the literature, this effect may last up to 60 minutes. Unless the patient is asked to switch on the machine several times a day, the pain will return after this first hour. Minor problems or almost cured injuries may need no more than 20 or 30 minutes of treatment. This can be done with the probes. If the patient suffers more pain, a longer treatment will be required. In most cases two to four hours will decrease the pain; and it is best to repeat this every second day. Daily treatments can be used in severe cases, but if side effects such as more pain occur, it is best to switch back to treatment every other day. Electrotherapy in the milliampere range can be used at three intensity levels. Depending on the theoretical basis of pain decrease one can use low, moderate or high intensity. Leading to possibilities known as: low intensity/high frequency (enkephalin release), moderate intensity/burst frequency (gate-control), high intensity/low frequency (endorphin release). Some authors conclude that there is no strict relation between frequency/intensity and the opioid type. Anyway, always give the patient good instructions about this. The effect may be zero if the intensity is set at wrong level. All authors agree that TENS is useless if the patient does not understand the information or if there are sensitivity disturbances at the electrode site(s). This again is different because microcurrent works at the microampere level. In almost all cases, maximum intensity (600 – 1000 µS) should be set. Most patients won’t even feel this. Sometimes a sharp spikey sensation is reported but that does not influence the effect. If the patient reports these sharp feelings as uncomfortable the intensity should be decreased until it disappears. For back problems, this will probably never happen. How do we know when the effect is good or fair? What does the patient report? It is important to have an answer to these questions because correcting one single parameter can influence results. “Most authors describe the endorphin release as a powerful tool to reduce pain, more powerful than the gate-control." Patients report first signs of pain decrease after 10 to 15 minutes of stimulation. Most patients say they have less pain than before treatment but the pain isn’t gone. Effects usually do not last longer than a few minutes. Those who reported unbearable pain before treatment usually have no effect at all after it. There is no evidence for this in the literature but it is often observed, probably because every system has its limits. Conclusion: intense pain shouldn’t be treated with TENS on gate-control basis and the effect is limited in time. This effect usually lasts longer than controlling the gates. However, the same problem occurs because even with pain decrease lasting 60 minutes after at least 20 minutes of stimulation, the effect is still limited. To get some comfort the patient will have to switch the TENS on again. The endorphin effect lasts longer than the enkephalin or dynorphin effect. Most authors describe the endorphin release as a powerful tool to reduce pain, more powerful than the gate-control. Sometimes “counter-irritation” and “Wedensky-inhibition” are mentioned as pain reducing effects. Probably only poor effects come from it and regular TENS frequencies are too low to cause this Wedensky-effect. Certainly, the patient won’t be pain free on this basis for hours. So let’s deny them for the purpose of this comparison. The observations made by Cheng indicate that currents above 5 mA will cause the ATP production and aminoisobutyric acid uptake to drop under control levels at electrode site. If the electrode site is the place of injury, this indicates that the current may cause a slowdown in the healing process. Due to electrode position in back pain, this may be no problem in this kind of treatment. MET causes no gate to close, neither is there an endorphin effect with trunk electrode positions. It has an effect at the cellular level, very close to the cause of the problem. Na2+ and Ca2+ seem to penetrate better through the cell membrane. Scientific reports tell there’s an increase in ATP production by 500 percent, plus 30-40 percent aminoisobutyric acid, and 255 percent hydroxi proline. The mechanisms aren’t fully understood but usually the patient is pain-free or has at least a very good effect after the first treatment. Effects can last a few minutes up to several hours or in rare cases, days. Nevertheless, if the pain comes back there is more good news because the effects are cumulative; if the effect doesn’t last long enough after the first treatment, it usually does after the second or third one. The intensity of pain decrease is an important parameter also because microcurrent usually manages to treat quite intense pain. There are limits, of course, but an overall impression is that the pain decreasing effects are much better than those of endorphin release. Usually TENS works well when used with facet joint problems. Other causes sometimes (even when indicated) give less of a result. MET responds well to almost every kind of back pain: facet joint, disc, degenerative joint disease, sacroiliaca joint, sub-clinical involvement of an organ, no matter what the cause. Contraindications of TENS are known and will not further be discussed. Interestingly, there are almost no contraindications for MET. Of course the use of an old demand-type pacemaker is on the list as is pregnancy but other than that, MET can be used almost without restrictions. To achieve its effects, TENS works either on gate-control or on gate-control and endorphin release, thus having a symptomatic pain relieving effect. Other effects on the pain will probably only be complementary. MET has a completely different mechanism, which at this time is not fully understood, but works on a cellular level and probably has its effects much closer to the cause of the injury. It looks as if TENS is going to lose this competition. TENS should only be used in vertebral electrode positions, whether the problem is a backache or not. MET on the other hand must be used in electrode positions with the injury (or the disease) between the electrodes. MET will, in most cases, be much more satisfying than TENS because of the longer lasting and more intense effects. However, a trial and observation approach is recommended. Some prefer the TENS sensation over the subthreshold MET treatment. Last but not least, one shouldn’t forget that literature indicates that there could be a negative effect of milliampere current on pathological tissue. Due to the necessary electrode positions in the treatment of back pain, this may be less important here. Although this paper is about electrotherapy and back pain, never forget that other therapy techniques (manual therapy, osteopathy, nutrition and exercise programs, even surgery etc.) may also be necessary to solve the patient’s problem. 1. Cappendijck S. Enkefalines en pijn; in Pijninformatorium, FA 1900, Voorhoeve P. Stafleu Samson, Alphen a/d Rijn, The Netherlands, 1996. 2. Carlson T., Jacobs A: Reflex Sympathetic Dystrophy Syndrome; Foot Surgery; p 149 – 153, Mar-Apr 1986. 3. Cheng N., Van Hoof H., Bockx E., Hoogmartens M., Mulier J., DeDijcker F., Sansen W., De Loecker W. The effects of electric currents on ATP generation, protein synthesis and membrane transport of rat skin. Clinical Orthopedics and Related Research, p. 264-272, Nov-Dec 1982. 4. Facchinetti F., Sforza G., Amidei M., Cozza C., Petraglia F., Montanari C., Genazzani AR; Central and peripheral beta-endorphin response to transcutaneous electrical nerve stimulation, Nida Research Monograph. nr 75, p 555-558, 1986. 5. Han J., Chen X., Sun S., Xu X., Yuan Y., Yan S., Hao J., Terenius L: Effect of low-and high-frequency TENS on MET-enkephalin-Arg-Phe and dynorphin A immunoreactivity in human lumbar CSF, Pain, p 295-298, dec 1991. 6. Hardy M, Hardy P. Reflex sympathetic dystrophy: the clinician’s perspective, Journal of Hand Therapy. p 137-149; Apr-Jun 1997. 7. Hooper P. Physical modalities, A Primer for Chiropractic; Williams & Wilkins, Baltimore, Maryland, USA, 1996. 8. Howson D. Peripheral neural excitability, implications for transcutaneous electrical nerve stimulation, Physical Therapy. vol 58, nr 12, p 1467-1473, December 1978. 9. Hughes G., Lichstein P., Whitlock D., harker C. Response of plasma beta-endorphins to trancutaneous electrical nerve stimulation in healthy subjects; Physical Therapy. vol 64, nr 7, p 1062-1066, July 1984. 10. Kirsch D. The science behind cranial electrotherapy stimulation, Medical Scope Publishing Corporation, Edmonton, Alberta, Canada, 1999. 11. Koel G. Transcutane Elektrische Neuro Stimulatie; Uitg. De Tijdstroom, Lochem, The Netherlands, 1991. 12. Lampe G. Transcutaneous Electrical Nerve Stimulation; in O’Sullivan S. Schmitz T. Physical Rehabilitation: Assessment and Treatment; FA Davis Cy. P 647-667, Philadelphia, USA, 1988. 13. Melzack R. The Puzzle of Pain, Penguin Books Ltd, Middlesex-New York, USA, 1977. 14. Nessler J, Mass D. Direct current electrical stimulation of tendon healing in vitro, Clinical orthopaedics and Related Research, p 303-312, Apr 1987. 15. Nuttall A., Guo M., Ren T. The radial pattern of basilar membrane motion evoked by electric stimulation of the cochlea, Hearing research. P 39-46; Mei 1999. 16. O’Brien W., Rutan F., Sanborn C., Omer G. Effect of transcutaneous electrical nerve stimulation on human blood beta-endorphin levels, Physical Therapy. vol 64, nr 9, p 1367-1374, Sep 1984. 17. Sobotta J., Becher H. Atlas der Anatomie des Menschen; Urban & Schwarzberg, Munchen-Berlin, Germany, 1962. 18. Travell J., Simons D. Myofascial pain and dysfunction, the triggerpoint manual; Williams & Wilkins, Baltimore, USA, 1983. 19. Walther D. Applied Kinesiology; Systems DC, Pueblo, Colorado, 1988. 20. Wilder R., Berde C., Wolokan M. Vieyra M; Masek B; Micheli L: Reflex Sympathetic Dystrophy in children; The American Journal of Bone and Joint Surgery. Vol 74A, nr 6, p 910-919, July 1992. I started to use portable TENS units in physical therapy about 12 years ago. I had the feeling that this was the best possible solution to do something about pain. But still too many patients kept complaining about pain and the additional use of drugs was often the only way out. On the other hand I realized that this way of treating pain is still only a symptomatic treatment. In April 1998 I started using the Alpha-Stim 100. From the very beginning I noticed that this microcurrent device offers much more and better possibilities than any TENS device. I use the Alpha-Stim in a variety of pathologies, as they are common in physical therapy, i.e. tendonitis, periostitis, traumatic ankle distortions, facet joint and intervertebral disc pain, etc. I had the opportunity to compare the Alpha-Stim to two other microcurrent devices and it is remarkable that there is still quite a difference. The Alpha-Stim shows its effects in less treatments and has a greater effect of decreasing the pain, i.e., the treatment of tendonitis of the supraspinatus muscle is sometimes only a matter of two treatments in three or four days. Of course this is in combination with manual therapy techniques but one of the remarkable effects is that further no drugs, such as NSAID’s, are being used. This leads to the conclusion that the Alpha-Stim microcurrent probably has its effects much closer to the cause of the injury or disease. Which is a welcome alternative to the variety of symptomatic treatments in physical therapy. I think that according to the need for evidence based physical therapy the Alpha-Stim technology is what PT’s are waiting for. The Alpha-Stim offers even more. The CES option is in physical therapy a welcome solution for the treatment of pathologies that include an overactivated sympathetic nervous system, such as in RSD and whiplash. CES was completely new to me and in this matter I want to thank you for lecturing here at the university in May last year. Your explanations on CES have been of great value to me and together with your book it helped me write the CES chapter in my book on electrotherapy.